The Pendeen Watch Light shone for the first time on Wednesday 3rd October 1900. In terms of safety at sea it was a great success, no ship had been wrecked on this dangerous stretch of coast since the light and foghorn were brought into use. September 5th 1910 was a fine day with excellent visibility and a calm sea. The 1500 ton William Cory was en route from Finland to Newport in south Wales with a cargo of pit props. She was a comparatively new ship and had seen only 14 months of service for the Cory Line of London. Her skipper, Captain Sinclair, was an experienced man and very familiar with the coast he was passing. There was no reason to expect anything to go wrong. By 5th September the William Cory was 8 or 9 days out, she'd been seen passing the Lizard earlier that morning and at 10.30 she'd passed the Longships. One report says she was seen passing between the lighthouse and Land's End but this not referred to elsewhere. The ship's log contained no entries following the 10.30 mention of the Longships. Observers on the cliffs said that she seemed unusually close to the Brisons before appearing to strike a rock off Botallack. Miners at Levant then reported her appearing immediately below the mine before she made some steam and turned out to sea. She appeared to be making a lot of water and soon turned back to the shore, running aground at 11.55. 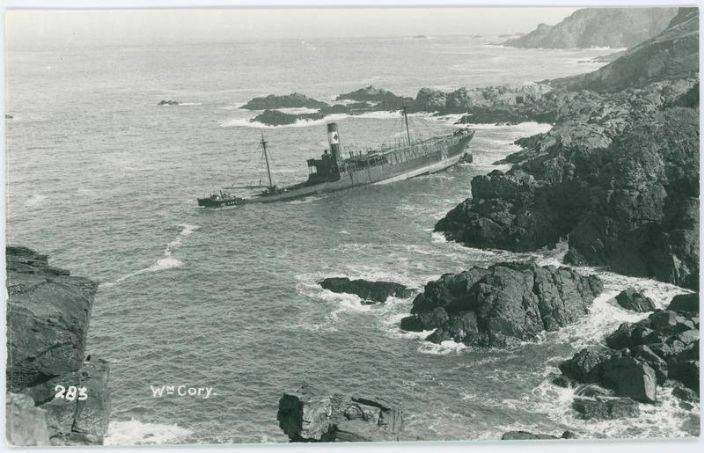 The William Cory had grounded on the Avarack, a flattish rock extending out from the foot of Boscaswell Cliff just north of Trewellard Bottoms. She was described as lying in an upright position, bows on the rocks and stern pointing out to sea. The mate and a couple of seamen left the ship in a boat to land on the far side of the lighthouse and the mate went ashore to telegraph news of the wreck. At this point the engines were being kept running in an attempt to prevent the vessel from slipping back into the deep water but the situation was all too clear and the crew abandoned ship. The tide was now flowing and as the water rose around the grounded ship it turned the vessel so that the bows were now pointing back the way the ship has come and the stern was pushed up high on the rocks. The fore part of the ship was now being swept by the waves and the deck cargo was soon swept into the sea. In West Penwith attention was focussed on the timber which was coming ashore. Over 1000 pit props were washed up around St Ives while in Pendeen Levant Mine were keen to profit and eventually reached a deal with the underwriters for the salvage of the cargo. In London, an enquiry got under way in the Caxton Hall, to investigate the loss of the William Cory. What emerged at the enquiry was that the skipper was on the bridge and navigating without a chart to hand though, as Captain Sinclair, put it, he had “photographed the chart in his mind” having looked at it before coming up to the bridge. As they passed the Vyneck, 2nd Officer David Morgan Protheroe reported Captain Sinclair having said, “Now we're clear of everything”, and the ship immediately struck. It was established that the William Cory was making 12 knots against a 3 knot current when she struck. James Eddy of St Just, out fishing, said he thought she had struck one of the Porthledden shoals, rocks which he said he knew well. Edward Anderson, 1st Engineer on the William Cory, said it was obvious as soon as she struck that she was sinking and that she had been beached only just in time. The evidence taken, judgement was reserved until October 18th. The published finding was that the William Cory had not, as Captain Sinclair's representative asserted, struck an uncharted object, but that she struck the charted outlying rocks of Botallack Head as a consequence of careless navigation by the master who had passed close to the Vyneck Rock and trusted to his memory for landmarks. His certificate was suspended for three months. Fortunately there was no life of life as a result of the loss of the William Cory. All that was lost was a ship, her cargo and her skipper's reputation. Whether Captain Sinclair captained another ship is unknown but given the amount of shipping and the demand for ship's officers it seems fairly likely.